The Central Provincial Government has come to rescue eight (8) boarding schools in Central Province after the schools reported low supplies in rations for students while awaiting tuition free fee (TFF) from the National Government through the Department of Education. 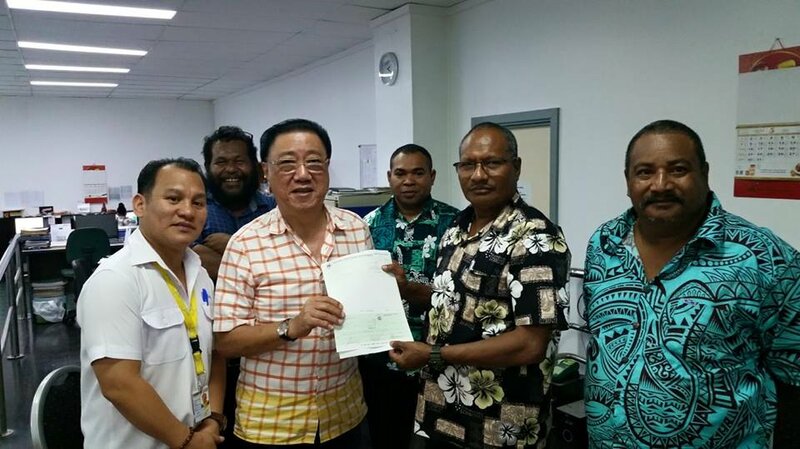 A cheque of K160, 000 was presented to SVS Mart Management last Friday 3rd June for the store to supply the eight schools with basic food items like rice, tinned meat & fish, and noodles to the respective schools. Central Provincial Administrator, Mr Gei Guni Raga while presenting the cheque said each school will receive K20, 000 worth of basic food rations calculated as 60 percent rice (10kg Rice) worth K12, 000, 30 percent canned protein worth K6, 000 and 10 percent noodles worth K2, 000. Mr Raga said the schools that are hit hard are the big boarding institutions with massive student populations and the schools are at the brink of closure, due to non-payments and long delays in the release of the Tuition Free Fee (TFF) subsidies. He told the management of SVS Mart at Taurama that only Principals with their respective schools trucks will come to pick up their rations and no other persons are allowed to represent any school, only Sacred Heart High school in Tapini, Goilala district will have their rations airlifted by Air Sanga to Tapini this week, as arranged by the Provincial Education Office. The eight schools are Kwikila Secondary School, Laloki Secondary School, Kupiano Secondary School, Mt Diamond SDA Secondary School, Mainohana Catholic Secondary School, Iarowari Secondary School, Sacred Heart High School Tapini, and Ianu High School. In the meantime, Central Provincial Education Advisor, Phillip Alu, said there is still much confusion as to how the TFF is calculated as the amounts received earlier this year by the Central Provincial High & Secondary Schools do not equate to the required amounts as per the 2015 school census reports.